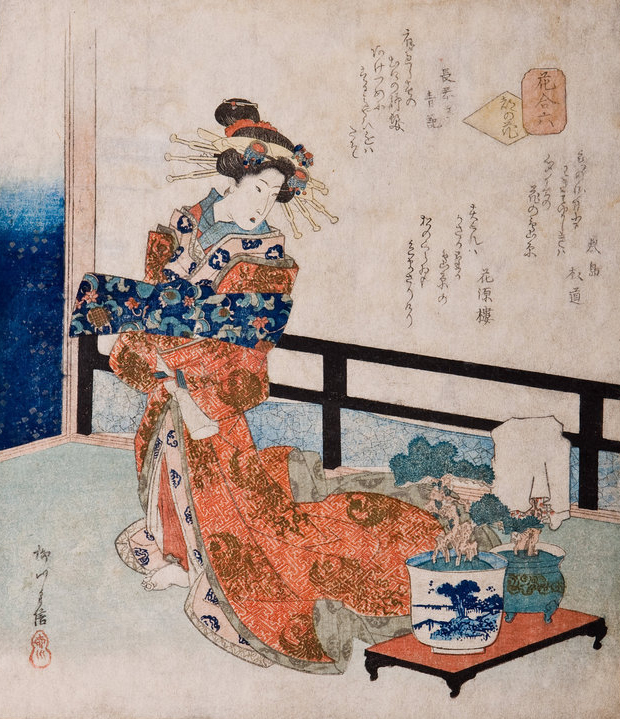 Above: A courtesan tending to bonsai. A Ukiyoe woodblock print by Yanagawa Shigenobu II (Act.1824-1860). Bonsai originated in China over two thousand years ago, and made its appearance in Japan around the 11th Century. The art of bonsai become popular in the United States after World War II. Bonsai are normal trees that have been trained to grow in shallow pots. The shapes are meant to convey something about the character of the tree, usually reflecting the forces of nature (wind, light, water, etc.) and the habitat of the tree. Developing bonsai can require many years of training with pruning and wiring. Wire is used to guide branches into desired positions and allow them to “set” in position. Pruning is used to develop taper and increase ramification of branches, allowing the bonsai to stay small over time.